If you have ever been in a sports bar, pool hall or game room, chances are pretty good you have at least seen a table shuffleboard game. A fun game for two to four players, table shuffleboard is a game that closely mirrors the original game of deck shuffleboard, but instead of using cues to move the puck-like sphere players use their hands. In the following article we will briefly define the game of table shuffleboard and highlight some of its most basic rules and strategy. We will also provide a series of tips that can help you play and win the game of table shuffleboard every time you engage in a game. The game of table shuffleboard goes by a number names, including American shuffleboard, indoor shuffleboard, slingers, shufflepuck and quoits. However, regardless of what is called, the object of the game is to push metal-and-plastic weighted pucks—also called weights or quoits—down a long smooth wooden table into a scoring area at the opposite end of the table. The game of table shuffleboard requires very little equipment to play. This equipment includes the shuffleboard table, the pucks or weights, and powder. One of the first things you will notice about a shuffleboard table is that it is very long and narrow. Shuffleboard tables come in a variety of sizes. While most all shuffleboard tables have a width of about 18-20 inches, their length can vary widely. Professional shuffleboard tables, those used for tournament play, have a length of about 22 feet; while regulation size tables have a standard length of 20 feet-8 inches. If you plan to play shuffleboard in a bar, chances are fairly good that the length of that table may fall under the regulation size. Instead, expect to play on a table that is anywhere from 9 feet to 20 feet long—just long enough to squeeze into a corner of the bar and provide enough room for everyone to play comfortably. In most cases, a bar shuffleboard table will measure about 12 feet. Shuffleboard tables have hardwood playing surfaces. Some of the best shuffleboard tables are made from maple and covered with a tough epoxy to resist scratches and dings, but the table can technically be made from any type of hardwood. Most shuffleboard tables have a slightly concaved shape, meaning they angle inward just slightly. This is done to keep the pucks from sliding off the sides of the table. Caring for a shuffleboard table is similar to caring for hardwood floors. You will need to clean and wax the table for best results, and if you want to speed up the action of the puck you can also coat it with a thin layer of silicone. If you have ever seen a table shuffleboard setup, you have probably noticed a thin layer of powder on the playing surface. This is no accident. Also known as salt or wax, table shuffleboard powder is actually made from tiny beads of silicone mixed with cornmeal. So why do players cover the shuffleboard table with this powder-like substance? It helps the puck to actually glide over the surface while also adding a degree of difficulty for players. Pucks can move so fast on a powdered-coated shuffleboard table that it may take two or three turns to get accustomed to the speed of the puck. Shuffleboard tables should be newly coated with the powder-like silicone substance before each game; and players can add additional powder mid-game from the well or gulley if they notice a dry spot on the table. Although the round discs in table shuffleboard are usually called pucks, their official title is “weights.” Regulation weight measure about 2.31 inches wide, but bar table shuffleboard setups may play with pucks measuring roughly two inches to make up for a narrower table. A puck set for a shuffleboard game comes with eight weights—four red and four blue. Each is supposed to weigh 12 ounces by official rule, but recreational pucks may weigh anywhere between 11 and 15 ounces. Here are some basic notes on how to play shuffleboard—from just prior to the game to the very end. Prior to beginning a game of table shuffleboard, the two individuals (or teams of two in “doubles”) will flip a coin. The winner of the coin flip can either have his choice of the red or blue-colored pucks; or he may choose the order in which he—or his team—will shoot (who will go first and who will go second). Because there is no real advantage to shooting with either the red or blue pucks, in most cases the winner of the flip will elect to shoot last—a position known as “the hammer.” In table shuffleboard, being the hammer carries with it a pretty good advantage, given that the last player has an opportunity to knock an opponent’s winning puck off the table. Prior to the game the two sides must also agree on how many points it will take to win the game. 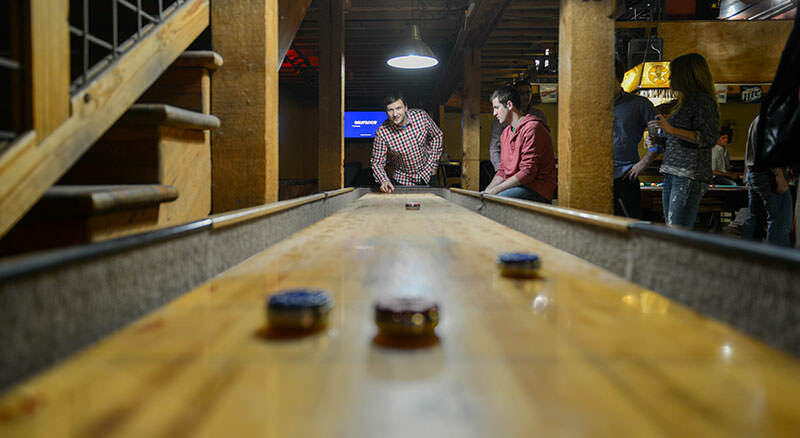 In regulation table shuffleboard, games are played to 15 points; but in many recreational settings the game is finished when one team reaches 21 points. Each player or team plays with 4 pucks. The following list will give you a great idea of how the game of table shuffleboard is played from start to finish. Alternate Shots. After the order is determined the game starts when Player 1 shuffles his first puck towards the scoring area, from there, players will alternate shots until all eight pucks have been shot. Must Stand Behind the Table. When shooting, players must stand with at least one foot behind the table. They are permitted to lean on the table for support, but they are not allowed to shake or move the table. Only farthest pucks of one color score. Only pucks that are farther than your opponent’s highest scoring pucks are eligible for points. Only one player or team can score per round. Pucks must clear the foul line. Only pucks that have cleared the foul line in the middle of the table are eligible for scoring (or blocking). Pucks that do not reach the foul line are cleared off the table. Three scoring zones. Players can score points in one, two or three scoring zones. Pucks must completely pass the line preceding the scoring zone to score points in that zone. Hangers. A hanger—when the puck is “hanging” over the edge of the playing surface on the opposite end—is worth 4 points in table shuffleboard. After each round. At the conclusion of each round, both players—or both teams of two players each—must agree upon how many points were scored and which player received credit for those points. The player who earned the points is required to shoot first in the next round. If no points were scored, the player who shot last in the preceding round must shoot first. Winner. The winner of the match is the first player or team to reach 15 or 21 points—depending on the number of winning points that were decided upon prior to the game. Dusting the Table. If during the match a player notices a dry spot on the table, he may reapply more powder from the excess in the well. Also, after each match the table should be completely re-powdered as a courtesy to the next players or teams on deck. As you can see, table shuffleboard is a lot of fun to play, but like any game, it is much more fun when you are winning. Here are just a couple tips to enhance your game. The grip on the table shuffleboard puck should be a gentle one. Holding it too tightly will cause you to lose your feel and create errant shots. The puck should be held softly with the thumb, index and middle fingers, using the remaining two fingers for guidance and aim. Most professional table shuffleboard players place the thumb on the left rim of the puck, the middle finger on the right rim, and the index finger on top of the cap of the puck for stability. The ring finger and pinky should be placed near, but not on the puck, and used to help control the speed and accuracy of the weight as it is released. Now that you have the perfect grip, it is time to make your shot. Here you have a lot of options, you can try to knock another player’s puck off the table; hit your own puck to advance it; or simply go for points by advancing your puck further than your opponent’s down the table. Each of these shots may involve different speeds—which you will master as your game progresses. The best advice is to shoot the puck with a very controlled and measured motion, releasing it only when you are ready to do so. Maintain this slow and steady pace with every puck you shoot, and remember to follow through. If this is your first time playing on a new table, be sure to take some quality practice shots. This will help you determine the speed of the table and any nuances. Once you have mastered the speed, take a few more shots to work on your accuracy. Put it all together and soon you will be the master of any table on which you play.